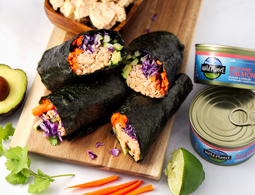 Spicy Salmon Nori Wraps - A recipe from Savor California, the online showcase for extraordinary gourmet foods and beverages from California. Empty Wild Planet Wild Pink Salmon into a bowl and lightly flake to incorporate juices. Add Sriracha and mix until just combined. Lay two sushi nori sheets on top of each other. Towards the bottom of the nori sheets, lay half of the salmon and Sriracha mixture in a horizontal line. Then, layer the purple cabbage, carrot, cucumber, avocado, and cilantro. Finish with a squeeze of fresh lime juice. Roll up starting from the bottom of the sheets. Wrap with an additional sheet of nori, if needed, and cut in half. Repeat with remaining sushi nori sheets and ingredients.